I’ve come close to attempting to make dry-cured sausages a couple of times, but never been able to get the right equipment together to make it happen. The sticking point is controlling temperature and humidity properly, so that the sausage cures without developing any nasty surprises, like botulism. 3) it’s a flavour bomb, an instant hit of spice and heat that can be used as a background layer or up front as the star of the show. Versatility is the key. First, some background. Mexican chorizo and the Spanish version are not the same thing, and need to be handled quite differently. Spanish chorizo is a cured sausage…it’s ‘cooked’, so you can slice a piece off and eat it without any problem. Mexican chorizo is raw and therefore needs cooking before eating. Think of it like a heavily spiced and seasoned minced meat, and just think of what you could do with just such a heavily spiced and seasoned minced meat. It’s sometimes stuffed into sausage skins for storage purposes, but more often, it just sits in a plastic container in the fridge until a spoonful or two are needed. A combination of pork cuts are needed – 500g of shoulder and 250g of belly. The shoulder provides bulk and substance, the belly brings fat. Chop the shoulder up into small pieces, about pea-sized, and coarsely mince the belly. Combine the two meats together and get heavy with the spices and seasonings…two teaspoons of cayenne pepper, and two of sweet paprika, with a teaspoon of ground coriander, half a teaspoon of dried thyme and a few gratings of nutmeg. Add two finely chopped cloves of garlic and splash over three tablespoons of wine vinegar. Finally, add 15g of salt and mix everything together thoroughly with your hands, squeezing the seasonings into the meat and making sure that everything is well blended. 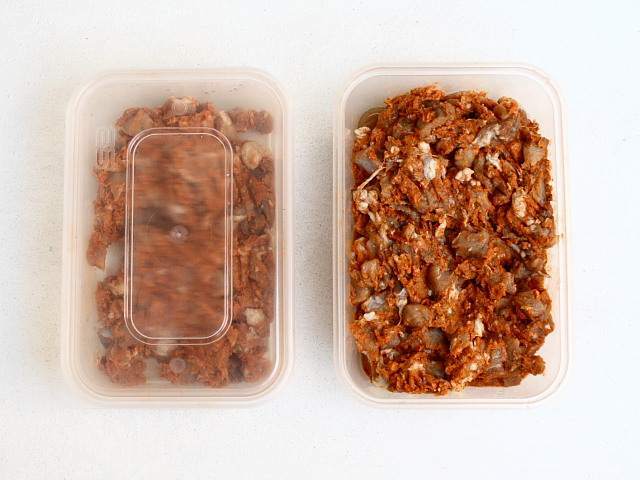 Keep the chorizo in a sealed plastic container, in the fridge, for up to a fortnight. Leave it for a day before using, to let the flavours develop. This type of chorizo is an incredible standby…a couple of tablespoons fried in oil with some onion as the basis of an omelette make a simple meal outstanding. Try it with broad beans, fried pieces of chorizo shaken in a pan with barely cooked beans, or in a similar way with shellfish. It adds a punch to a bowl of fried potatoes and a small amount goes a long way as the basis of a simple vegetable soup. I’ve wanted to try this recipe of Hugh’s for ages and I’m glad to see it works so well with good results! Awesome. Like you, I’ve been wondering how to get on this action without a curing chamber. two weeks, it keeps for? I’ll give this a go (and probably pick up the book, too). good work, Rich. There are plenty of ways to make a curing chamber, but the best I’ve come across involves repurposing an old fridge and installing a humidifier and regulator to turn the whole thing on or off depending on the temperature.